Battalion History by Month – The 60th Battalion C.E.F. "Victoria Rifles of Canada"
Each unit of the Canadian Expeditionary Force was required to keep a diary of its activities in the field. Three copies were made; two were sent to the Adjutant General’s Office and one to the Canadian War Records office in London. The Battalion’s War Diary starts February 20, 1916 as the Battalion left England for France. Prior to that the War Diary is a one page summary of it’s activities. 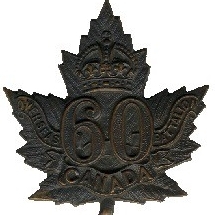 Click on the links below to view the 60th Battalion’s activities for that month. Each month includes the War Diaries, Operation Orders and other information for that month.